The room was originally Christian IV’s bathroom, which was connected by a passage to the King’s toilet and bedroom. The bathroom was closed in 1705-1706 and converted into a room for Frederik IV and Queen Louise, in connection with their shared bedroom. 451. Queen Louise painted as Crown Princess, half-length portrait by Jacob d’Agar 1695-99. 452. Fire-screen, probably embroidered by Frederik IV’s mother, Dowager Queen Charlotte Amalie. 453. Mirror with candlesticks, Bohemia c.1700. 454. The Apotheosis of Art. 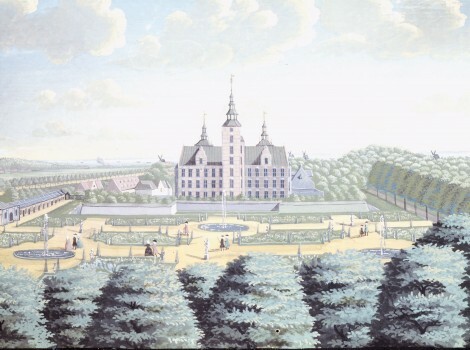 Painting by Hendrick Krock 1700. 455. Mirror with candlesticks, Nuremberg c.1690. 456. 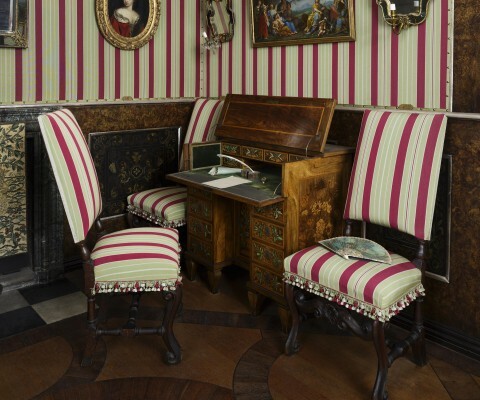 Four chairs, Copenhagen c.1690. 457. Writing desk, walnut, inlaid with flowers of bone and mother-of-pearl. 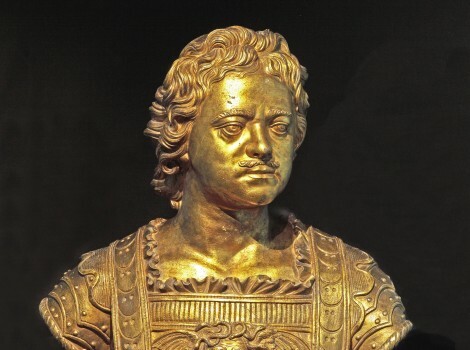 On the lid, weapon-trophies and a crowned “C” for Prince Carl or Crown Prince Christian (VI)? Copenhagen, 1710-20? 458. Paper cone with Norwegian freshwater pearls, to which the Danish Queen had sole and exclusive right. 459. Ivory fan with lacquer painting, said to have been bought by Frederik IV in Italy and presented to the Queen. 460. Five-part folding screen of plaited straw with rural and chivalrous scenes. Germany c.1675. 461. Bacchus and Ariadne. Painting by Hendrick Krock, 1713. 462. Two cabinets with inlaid mosaics of semi-precious stones. 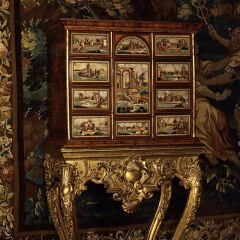 The mosaics were brought back from Florence by Frederik IV in 1709, while the cupboards themselves are attributed to Court Cabinetmaker Claus Harder 1710-20. The table feet were renewed c.1740. Belonged to Frederik IV’s and Queen Louise’s only daughter, Princess Charlotte Amalie. 463. Set of vases with laque brillante, made by Queen Louise as presents for Frederik IV. 464. Tilting table with inlays of flowers, attributed to Claus Harder c.1710. 465. Two sets of cups and saucers with Frederik IV’s monogram, from c.1700. The cups are Chinese, the saucers Japanese. 466. Two tea-pitchers of Kang’shi-porcelæn, China 1700-25. 467. Jupiter and Io. Painting by Hendrick Krock, 1713. 468. Clock with hour-stroke, clad in tortoiseshell and silver, drawer containing an apothecary. The dial has the mark: Georg Braun. Silver work signed J.A. Thelott. Apothecary marked Elias Adam, Augsburg 1708-13. 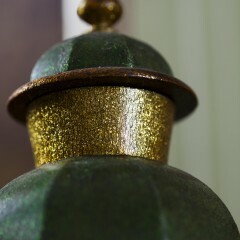 Belonged to Princess Charlotte Amalie. Bènoit le Coffre was the most important painter in Denmark during the reign of Frederik IV. He was born in Copenhagen and educated in Paris. In 1700 he was appointed Painter of the Court. 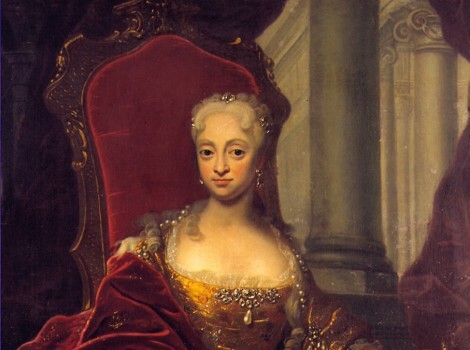 Louise became Queen of Denmark in 1699. She was the daughter of Gustavus Adolf of Mecklenburg-Güstrow. In 1695 she was married to Crown Prince Frederik (IV) and together they had the son Christian (VI). The 18th century was initiated with yet another war between Denmark and Sweden. For Denmark the war was brief, but for Sweden it was the beginning of the Great Nordic War, which Denmark became part of again from 1709. 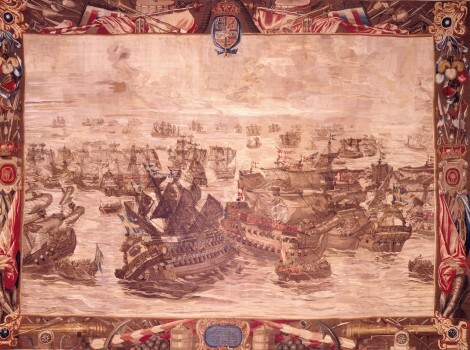 The conclusion of the Great Nordic War in 1720 was the beginning of a long Danish period of peace. 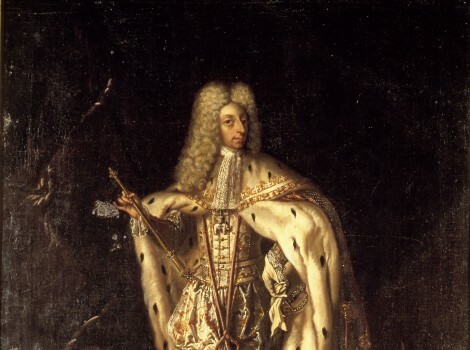 Christian VI succeeded Frederik IV in 1730, and his was the first reign during which Denmark was not at war. The wars of Charles Gustavus (1657-1658 and 1658-1660) were the important events in foreign politics of the period. 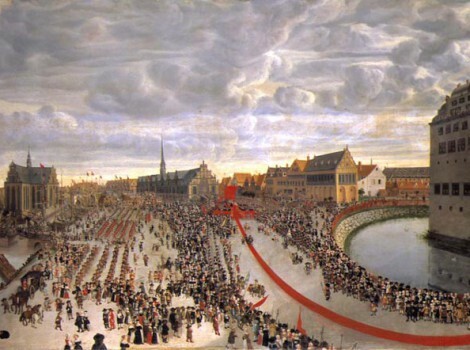 The loss of Scania, Halland and Blekinge at the Peace of Roskilde in 1658 was a nadir of power politics in Danish history. Frederik IV was the King of Denmark-Norway from 1699; son of Christian V and Charlotte Amalie of Hesse-Kassel. 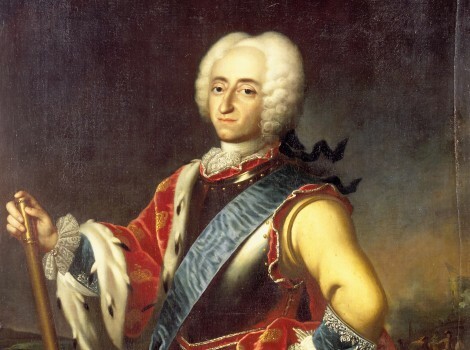 Married for the first time in 1695 to Louise of Mecklenburg-Güstrow, with whom he had Christian (VI). ‘Apollo Flaying Marsyas’. 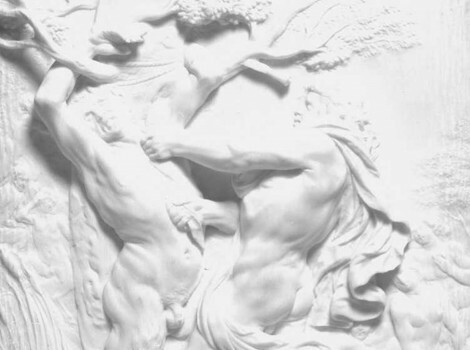 The relief, which depicts the punishment by the gods, was made by Joachim Henne c. 1680, after a painting by Jan Liss.